Impression of the cylinder seal of Ḫašḫamer, a high priest of Sîn, ca. 2100 B.C.E. 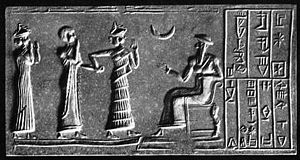 The seated figure is probably King Ur-Nammu, who dedicated the great ziggurat of Ur in honor of Nanna/Sîn, who is present in the form of the crescent. Nanna, also called Sîn (or Suen) was a Sumerian god who played a longstanding role in Mesopotamian religion and mythology. He was the god of the moon, the son of the sky god Enlil and the grain goddess Ninlil. His sacred city was Ur, and temples dedicated to him have been found throughout Mesopotamia. The daughters of Mesopotamian kings were often assigned to be his high priestess. The worship of Nanna was associated with the breeding of cattle, which was a key part of the economy of the lower Euphrates valley. Known as Nanna in Sumer, he was named Sîn (contracted from Su-en) in the later civilizations of Babylonia and Assyria, where he had a major temple in Harran. His wife was the reed goddess Ningal ("Great Lady"), who bore him Shamash (Sumerian: Utu, "Sun") and Ishtar (Inanna), the goddess of love and war. In later centuries, he became part of an astral triad consisting of himself and his two great children, representing the positions of sun and morning star (Venus). In art, his symbols are the crescent moon, the bull, and the tripod. In his anthropomorphized form, Sîn had a beard made of lapis lazuli and rode on a winged bull. 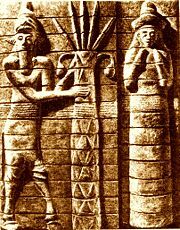 In Mesopotamian mythology, Nanna was the son of the sky god Enlil and and the grain goddess Ninlil. Nanna's origin myth is a story of his father's passion and his mother's sacrificial love. The virgin Ninlil bathes in the sacred river, where she is seen by the "bright eye" of Enlil, who falls in love with her and seduces (or rapes) her. The assembly of the gods then banishes Enlil to the underworld for this transgression. Ninlil, knowing she is pregnant with the "bright seed of Sîn," follows Enlil to the world of the dead, determined that "my master's seed can go up to the heavens!" Once the moon god is born in the underworld, three additional deities are born to his parents, allowing Nanna/Suen to take his place in the skies to light up the night. Nanna's own best-known offspring were the sun god Shamash and the great goddess of love and war, Inanna, better known today as Ishtar. King Melishipak I (1186–1172 B.C.E.) presents his daughter. The crescent moon represents Sîn, while the sun and star represent Shamash and Ishtar. The moon played a key role in Mesopotamian religious culture. As it moved through its phases, people learned to keep their calendars based on the lunar month. Nanna (or Suen/Sîn) was sometimes pictured as riding his crescent moon-boat as it made its monthly journey through the skies. Some sources indicate that the moon god was called by different names according to various phases of the moon. 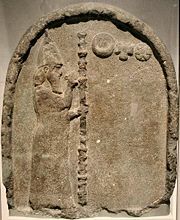 Sîn was especially associated with the crescent moon, while the older Sumerian name Nanna was connected either to the full or the new moon. The horns of a bull were also sometimes equated with the moon's crescent. People speculated that perhaps the crescent moon-disk was Nanna's crown, and thus one of his titles was "Lord of the Diadem." As the mysterious deity of the night, he was also called "He whose deep heart no god can penetrate." His chief attribute, however, was wisdom, which he dispensed not only to humans through his priests, but also to the gods themselves who came to consult him every month. Sîn's status was very formidable, not only in terms of the temples dedicated to him, but also in terms of astrology, which became a prominent feature of later Mesopotamian religion, and even legal matters. For an entire millennium—from 1900 to 900 B.C.E.—Sîn's name is invoked as a witness to international treaties and covenants made by the Babylonian kings. His attribute of wisdom was particularly expressed in the science of astrology, in which the observation of the moon's phases was an important factor. 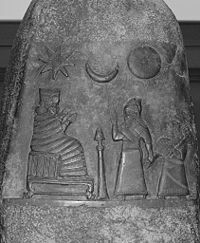 The centralizing tendency in Mesopotamian religion led to his incorporation in the divine triad consisting of Sîn, Shamash, and Ishtar, respectively personifying the moon, the sun, and the planet Venus. In this trinity, the moon held the central position. 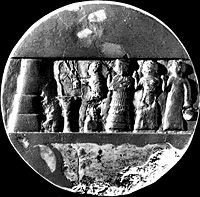 However, it is likely that Ishtar came to play the more important cultural role as time went on, as she rose to the key position among the Mesopotamian goddesses, while younger deities like Marduk came to predominate on the male side of the pantheon. Nabonidus (sixth century B.C.E.) venerates the triad of Sin, Shamash, and Ishtar. The two chief seats of Sîn's worship were Ur in the south, and later Harran to the north. The so-called "giparu" (Sumerian: Gig-Par-Ku) at Ur, where Nanna's priestesses resided, was a major complex with multiple courtyards, a number of sanctuaries, burial chambers for dead priestesses, a ceremonial banquet hall, and other structures. 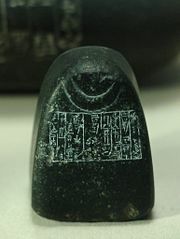 From about 2600-2400 B.C.E. ), when Ur was the leading city of the Euphrates valley, Sîn seems to have held the position of the head of the pantheon. It was during this period that he inherited such titles as "Father of the Gods," "Chief of the Gods," and "Creator of All Things," which were assigned to other deities in other periods. The cult of Sîn spread to other centers, and temples of the moon god have been found in all the large cities of Babylonia and Assyria. Sîn's chief sanctuary at Ur was named E-gish-shir-gal ("house of the great light"). In spring, a procession from Ur, led by the priests of Nanna/Sîn, made a ritual journey, to Nippur, the city of Enlil, bringing the year's first dairy products. Sîn's sanctuary at Harran was named E-khul-khul ("house of joys"). Inanna/Ishtar often played an important role in these temples as well. On cylinder seals, Sîn is represented as an old man with a flowing beard, with the crescent as his symbol. In the later astral-theological system he is represented by the number 30 and the moon, often in crescent form. This number probably refers to the average number of days in a lunar month, as measured between successive new moons. Writings often refer to him as En-zu, meaning "Lord of Wisdom." One of Nanna/Sîn's most famous worshipers was Enheduanna, his high priestess who lived in the twenty-third century B.C.E. and is known today as the first named author in history, as well as the first to write in the first person. The daughter of King Sargon I, her writings invoke Inanna's aid as Sîn's daughter, far more than they dare to speak to the god directly. After Enheduanna, a long tradition continued whereby kings appointed their daughters as high priestesses of Sîn, as a means of solidifying their power. 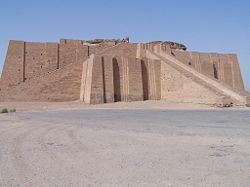 The great ziggurat of Ur. The great ziggurat of Ur was dedicated to Nanna and Inanna in the Sumerian city of Ur (in present-day southern Iraq) in the twenty-first century B.C.E. A huge stepped platform, in Sumerian times it was called E-temen-nigur. Today, after more than 4,000 years, the ziggurat is still well preserved in large parts and has been partially reconstructed. Its upper stage is over 100 feet (30 m) high and the base is 210 feet (64 m) by 150 feet (46 m). The ziggurat was only part of the temple complex, which was Nanna's dwelling place as the patron deity of Ur. The ziggurat served to bridge the distance between the sky and the earth, and it—or another like it—served as the basis for the famous story of the Tower of Babel in the Bible. It later fell into disrepair but was restored by the Assyrian King Shalmaneser in the ninth century B.C.E., and once again by Ashurbanipal in the seventh century B.C.E. Measuring weight with the symbol of Nanna used by his priests at Ur and dedicated by King Shulgi in the twenty-first century B.C.E. O Sîn, King of the Gods of Heaven and the Netherworld, without whom no city or country can be founded, nor be restored, when you enter (your temple) E-khul-khul, the dwelling of your plenitude, may good recommendations for that city and that temple be set on your lips. May the gods who dwell in heaven and the netherworld constantly praise the temple of E-khul-khul, the father, their creator. As for me, Nabonidus, King of Babylon, who completed that temple, may Sîn, King of the Gods of Heaven and the Netherworld, joyfully cast his favorable look upon me and every month, in rising and setting, make my ominous signs favorable. In any case, Nabodinus' support for the temples of Sîn seems to have alienated the priests at the capital of Babylon, who were devoted to Marduk and consequently denigrated Nabonidus for his lack of attention to his religious duties in the capital. They later welcomed Cyrus the Great of Persia when he overthrew Nabonidus. After this, Sîn continued to play a role in Mesopotamian religion, but a waning one. In Canannite mythology, he was known as Yarikh. His daughter Ishtar, meanwhile, came to play a major role among the Canaanites as Astarte. The Hebrew patriarch Abraham had connections both to Ur and Harran, where he certainly must have encountered the moon god as a major presence. His descendants, the Israelites, rejected all deities but Yawheh, but they apparently retained the new moon festivals of their Mesopotamian ancestors. Numbers 10:10 thus instructs that: "At your times of rejoicing—your appointed feasts and New Moon festivals—you are to sound the trumpets over your burnt offerings and fellowship offerings, and they will be a memorial for you before your God." Christian writers have sometimes seen a connection between Sîn and the Muslim god Allah, noting that before his conversion to Islam, Muhammad himself worshiped several deities, including the moon, and that Islam adopted Nanna's crescent as its symbol. Black, Jeremy A., Graham Cunningham, Eleanor Robson, and Gabor Zolyomi (eds.). The literature of ancient Sumer. Oxford: Oxford University Press, 2004. ISBN 9780199296330. Green, Tamara M. The City of the Moon God: Religious Traditions of Harran. E.J. Brill, Leiden, 1992. ISBN 9004095136. This page was last modified on 21 January 2009, at 19:43.